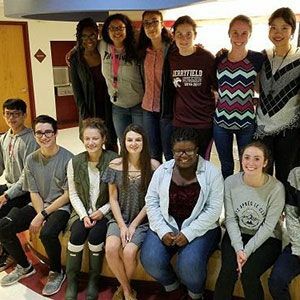 After a thorough application and review process, Breakthrough Manchester has selected 16 high school juniors and seniors to teach, tutor, and mentor its seventh and eighth grade students this school year, including ten from The Derryfield School. Students were chosen based on a written application and essays, a teacher recommendation, review of transcripts, and a five-minute mock teaching exercise presented to peers and external evaluators. Students represent Manchester Central, Manchester Memorial, Manchester School of Technology, Merrimack High School and The Derryfield School. School-year teaching interns provide support to Breakthrough middle schoolers in three ways over the course of the school year; teaching 40-minute classes and providing in-person tutoring on five specific “Super Saturdays,” providing remote tutoring as needed between these Saturdays, and mentoring through twice-monthly check-ins with students. The Breakthrough school-year internship can be an extraordinary opportunity to learn and practice the basic skills of teaching, public speaking, collaborative lesson planning, and mentoring younger students. Teaching and mentoring at Breakthrough can be a life-changing experience for high school students. Breakthrough Manchester will hire 24 college undergraduates, from freshman to senior, as summer Teaching Fellows for our award-winning, paid, nine-week program. Two weeks of training, weekly support from professional educators, and the opportunity to work with Breakthrough's stellar middle school students make an extraordinary summer experience! The process is competitive and we generally hire 70-80% of our Teaching Fellows from the Early Action pool of candidates. Learn more and apply. The Early Action Application Deadline January 11, 2018.